We've had a very busy day today with our Easter Fayre. We've had an Easter Bonnet parade, decorated egg competition and our annual Egg Dump won by Molly Potts!! Mrs Shankland did very...she won the Heads Easter Bonnet Competition...luckily for her she as the only one in it!! Class 3 did a lovely assembly today called 'Special People' and there were some teary eyes in the room, including Mrs Shankland! The orienteering season has begun again with the first event at Whitehaven Academy and the weather was glorious! A special assembly for World Autism Awareness Day. It's always a pleasure to give 100% attendance certificates at the end of term. Some of these from Spring also had 100% attendance during the Autumn term so they're hopefully heading for a full year of perfect attendance! Well done to everyone today. The choir performed well as part of Mr Strachan's joint school concert at Dearham School last night. There were some lovely soloists from our school who sang beautifully! Well done to Anya, second left, for representing school in the annual Cockermouth Consortium Speakers Competition at the United Reformed Church last night. She was very articulate with her speech about Women's Rights! It was lovely to have Ian Routledge, Assistant Head at Cockermouth School and David Mulloy the Mayor of Cockermouth, to present the winning prizes. What a fantastic day we had at Rock Challenge yesterday. Everyone rose to the challenge and performed brilliantly. A huge thank you to all those who made our entry possible! Then they set Mrs Shankland up in a Red Nose Quiz.....she had to sit on her throne...….Faye got the easy questions, the answers to Elliot's questions were all 'pass' and Mrs Shankland got the hard questions and came last! Mrs Shankland and her little 'Where's Wally' friends! There were some fantastic characters! Have a look at more pictures of Class 4 and their Internet Safety assembly in Celebration Assembly. Well done to the Year 5 children who all passed their cycling proficiency test today. A big thank you to Adam from Cyclewise for working so hard with them in very chilly weather! We had an interesting visit from Mr David Malloy who is the Mayor of Cockermouth. He talked to all the children about how he became the Mayor, what his role is and how he enjoys promoting the lovely town of Cockermouth. here he is with our elected School Council members and also Faye and Elliot, Head Boy and Girl. On Saturday 19th January our school football team took part in the annual Sands Centre competition. We played very well managing two draws and one win! Unfortunately, we did not get to the second round but were very pleased to walk away undefeated! All boys played very well and demonstrated fantastic sportsmanship, we are very proud of the team. We would also like to thank the parents who came along to support the children. We think there is lots of potential for this team in the future! Well done! What a fantastic nativity Reception and KS1 performed for us today! Well done to all children and staff involved. We all enjoyed a great Christmas lunch today with our special visitors who volunteer and help us all in school. Thank you to Mrs Farley for the wonderful meals she serves us all year and not on this special day! Christchurch was full of family and friends for this year's Carol Service this morning. The children all enjoyed looking at the wonderful trees which are decorating the church this year. Thank you for having us Reverend Butland! All the children came in Christmas jumpers today, and the staff, raising money for Save the Children Fund. This year our performance was called ‘Lights, Camel, Action!’ It was a KS1 only performance (with a little help from our friends in the choir) and they did brilliantly. The children were singing and dancing away. Well done to all the children involved! The dress rehearsal went really well. We had visitors from the village, church and Johnson House in Whitehaven...it's promising to be a great show! Mrs Cockton kindly presented Class 5s Christmas boxes to the Children's Ward when she visited recently. They were delighted to receive them. We had a fantastic time learning all about Christmas and the Messiah. Well done to the Year 6 volunteers that helped! Even though it was too windy to go to Forest School today, Forest School came to the classroom! Year 2 children upwards had a fascinating morning being shown lots of memorabilia from WW1. Some children got dressed up too! Christmas has arrived in school! We had a really successful Christmas Fayre last night and raised £895 for school fund which was fantastic! It was great to have Revd Butland leading our assembly this morning. He talked about the colour purple and its link to Advent. We also shared the new 'ABLE' banners with the children! Mrs Bewsher launched the ABLE motto box in assembly today. This clear box is going to be kept in the hall and the aim is to fill it with red counters. A red counter will given to a child when they have carried out something related to the motto. This could be anything from opening a door for a visitor to helping someone in ned in school. Counters will be given out by members of staff only and by our Head Boy, Elliot and our Head Girl, Faye. We had a lovely service in school today to unveil the memorial stone for the scholars of Broughton Primary School who died in World War One. There are some lovely displays of work in classes too linked to our WW1 btheme. Class 6 had an exciting time today with a film crew from United Utilities. 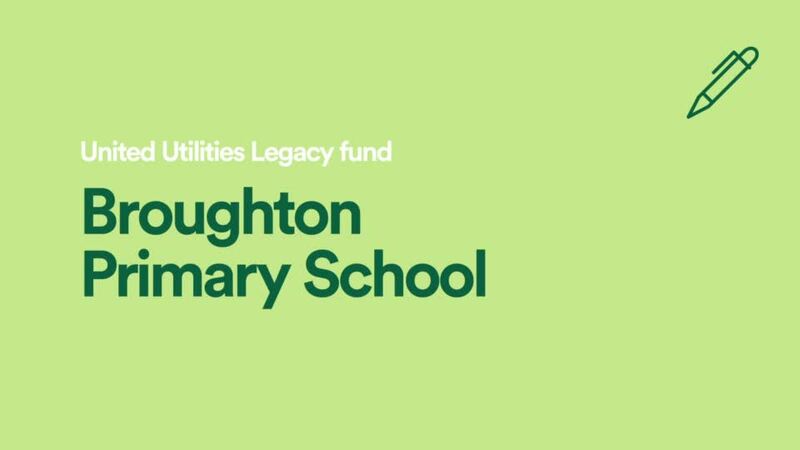 They were filming and recording the children working on their WW1 project as United Utilities have provided funding for a WW1 memorial plaque to remember the ex scholars of our school who dies in WW1. The memorial will be unveiled on November 11th, Armistice Day. All the children in Year 5/6 enjoyed their bouncy castle treat as they all completed their Strive for 5 Reading Challenge this half term. Keep it up all of you! Today we said a sad farewell to Audrey who has been a mid-day supervisor with us for many years. Everyone from Nursery upwards enjoyed the KABs Halloween disco last night. We enjoyed a lovely Harvest service in Christs Church this morning. There were some fantastic Harvest themed poems and songs from children from Year 1 upwards. We managed to raise £67.33 from selling the produce we collected. The money will go to the Bishops Appeal for the Hungry. Nat came today and led all our children in a day of wheelchair basketball. It was great fun! Nat talked in assembly about the importance of perseverance and dedication in order to achieve your goals, important lessons for us all to learn. Thank you to all the friends and family of Reception who came to support them raise funds for McMillan Cancer at their coffee morning today. Well done to School Council for leading our 'Jeans for Genes Day' raising £123 for this great cause, which helps children and families with genetic disabilities. Our six Year 5/6 runners have settled in well at Fairfield School, part of a new incentive to encourage children to run with Bodyfit Running Club and our local consortium of schools in and around Cockermouth. We're delighted that four of our G&T runners from Year 6 last year are being used as positive role models and Young Leaders at the club. Year 5 and 6 had a great time up at Whinlatter watching the Team Trial finish, part of the Tour of Britain. It was a really exciting day, especially pleasing as Hollie from Year 6 last year was up on the stage presenting the winning team with the jersey she designed! We had fun in assembly introducing the Jigsaw theme for this half term of 'Being me in My World' but not sure Jake enjoyed having shaving cream on his face!! One of our ex pupils Luke Greenbank came to share his success at the Commonwealth Games with us. Luke was part of the GB team who came second in the 400m Medley Relay, where he was swimming the backstroke leg. The games were on the Gold Coast and this was an exciting time for Luke, his family and us! We're very proud of him!